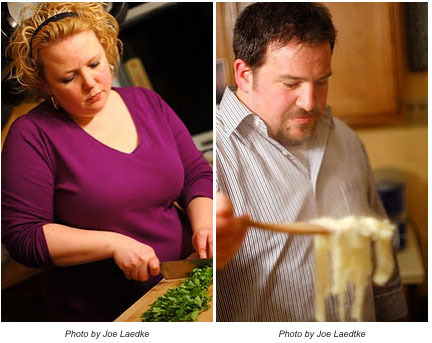 Today we have Peef and Lo (aka Paul and Lori Fredrich), two Milwaukeeans who share their passion for seasonal cooking, local, sustainably raised, and organic foods, local eating, and entertaining over at their blog Burp! Where Food Happens. Besides being devotees of such wonderful things as farmer’s markets, microbrews, whimsical kids birthday cakes and bacon, Peef and Lo are also leaders in the Milwaukee foodie community, coordinating #MKEFoodies tweet-ups, Cookies for Kids Cancer events and other social activities to bring local foodies together. When we asked them to participate in our potluck, we were thrilled to hear that they were already planning a Thanksgiving dinner for some fellow foodie friends and would be able to share their turkey secrets with us. Read on to meet Peef and Lo and their tasty bird! Favorite Thanksgiving Dish or Tradition? Although we love traditional holiday fare, we can’t help mixing things up a bit each year. Whether it’s serving up our turkey with a Oaxacan mole sauce, or pulling out all the stops with a bourbon infused pumpkin pie with candied espresso spiced walnuts, we’re always interested in trying out new twists with old favorites. Pumpkin is the epitome of autumnal foods. But, that pumpkin pie doesn’t need to be boring. Adding candied pecans, a dollop of whiskey whipped cream, or some candied ginger allows you to reinvent a Thanksgiving classic. No fear. Great cooking embraces experimentation and adventure. The most important thing is to have fun and always enter the kitchen with an open mind. It’s going to sound cliché, but we are both so grateful for our family and friends. We are lucky to have so many wonderful people who love us, support us, and help us eat all of that delicious food we make! This is one of our favorite holiday turkey recipes. We discovered brining a few years ago, and have never turned back. This particular maple brine is a natural choice, since it produces a fragrant, flavorful bird with an exceedingly moist interior. We love to smoke the brined bird in our Orion Convection Cooker with a bit of cherry or apple wood. But, it’s also fantastic prepared in a more traditional fashion by roasting it in the oven. Combine all ingredients in a large pot. Bring to a boil, then simmer for 10 minutes. Refrigerate until cold. To prepare turkey, remove and reserve giblets and neck from turkey. Rinse turkey with cold water; pat dry. Trim excess fat. Place turkey in large stockpot. Pour cooled brine over the top, adding additional water as necessary. Refrigerate for 24-48 hours, turning bird occasionally. 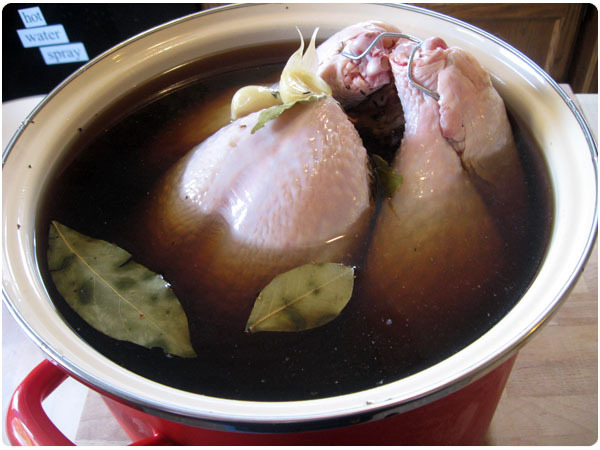 For a crisp skin, remove bird from brine, pat dry, and place in a roasting pan overnight (uncovered). For traditional roasted turkey: Preheat oven to 500ºF. Roast turkey for 30-40 minutes. Reduce oven temperature to 350º and bake until bird reaches an internal temperature of 160º in the deepest part of the thigh. Using this technique, a 14 pound bird should require a total of about 2 hours for roasting. 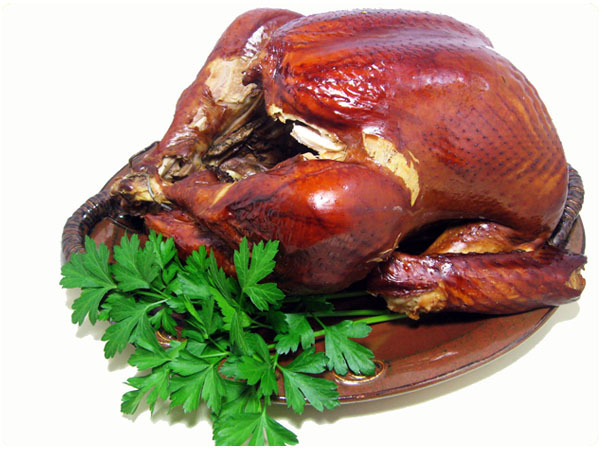 For smoked turkey: Smoke with Apple or Cherrywood. In a traditional smoker, you should figure you’ll need about 30 minutes per pound when smoking at about 230 degrees F. We use an Orion Convection Cooker with amazing results. Cooking time is about 7 minutes per pound (1 ½ hours for a 12lb bird). 1. Use the best turkey you can afford. Avoid turkeys that are injected with salt solutions or water. If possible, buy a fresh organic Heritage breed turkey. These classic birds are superior in both flavor and texture to traditional grocery store birds. 2. Brining is a fantastic way to add both moisture and flavor to your turkey. 3. Skip the traditional stuffing. A turkey will cook more evenly (and safely) if it is not densely stuffed. In lieu of traditional dressing, consider adding flavor by loosely filling the cavity with aromatic vegetables and herbs. For this recipe, we like onions and fresh thyme. Or try quartered pieces of fresh orange with a few cloves of smashed garlic. 4. Truss your turkey for best results when baking. 5. Tent the bird with foil and allow it rest for at least 15 minutes before carving. This allows the bird to retain its succulent juices, and will result in more tender breast meat. It’s so much fun to be introduced to new blogs and to read each person’s Thanksgiving Q&A’s! And the holiday recipes are just an extra bonus. I’m stuck on the idea of mixing things up each year. Mole sauce with turkey? Yes please! Thanks, HAP, for sharing your friends!